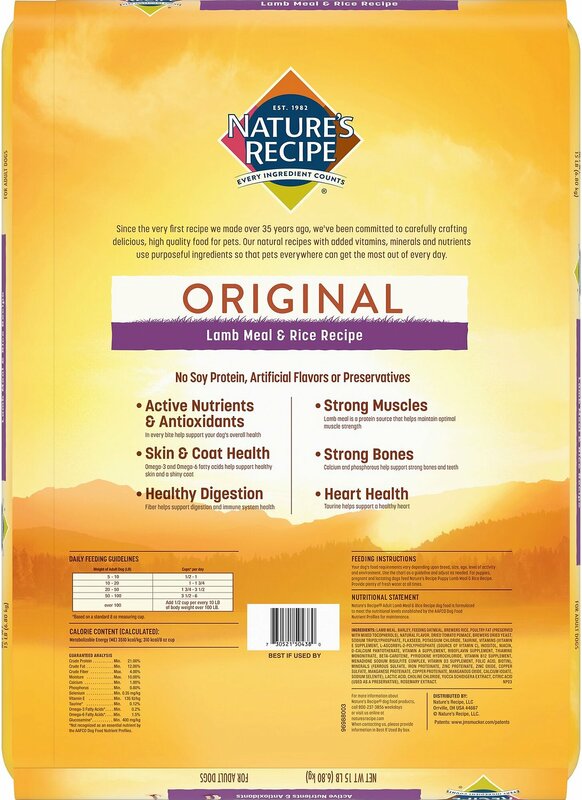 Nature's Recipe Adult Lamb Meal & Rice Recipe is specifically formulated to meet the nutritional needs of an active adult dog. 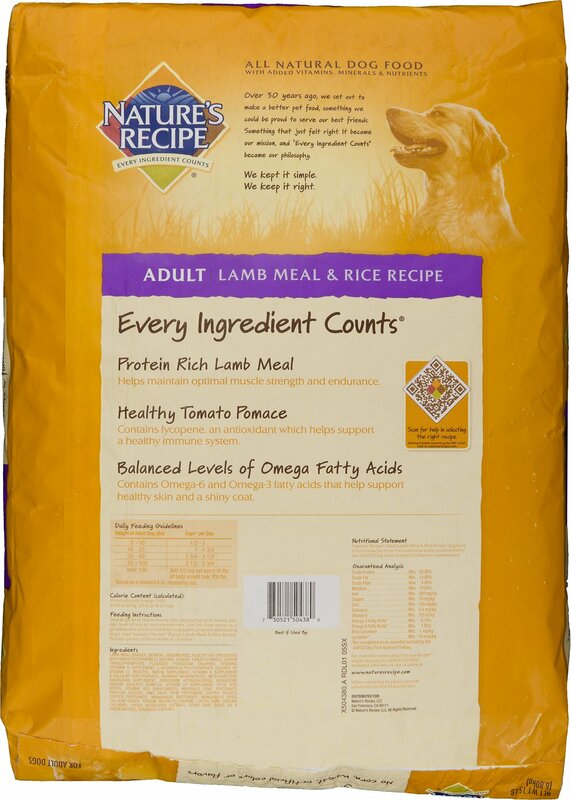 That's why they use lamb meal, a source of protein to maintain your dog's healthy muscles and energy, and they add flaxseed as a source of Omega fatty acids. Natural dog food formula with added vitamins, minerals, and nutrients needed during the active puppy life stage. 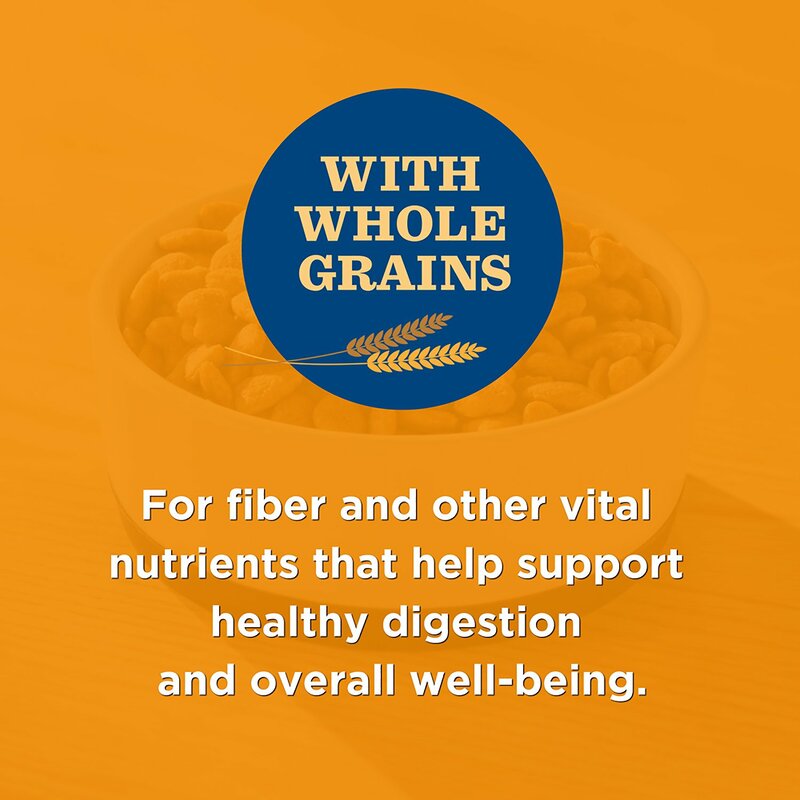 Oatmeal and barley are natural sources of fiber for healthy digestion. 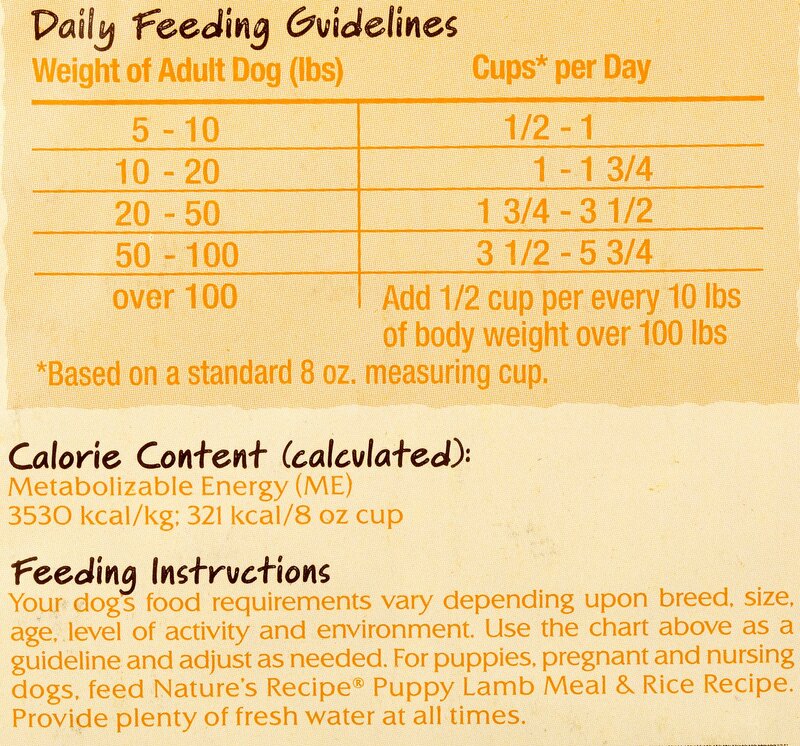 Your dog's food requirements vary depending upon breed, size, age, level of activity and environment. Use the chart below as a guideline and adjust as needed. 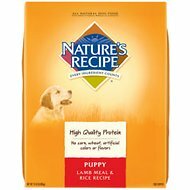 For puppies, pregnant and nursing dogs feed Nature's Recipe Puppy Lamb Meal & Rice Recipe. Provide plenty of fresh water at all times. We have a pit mix who has been eating this food for 5 years and 2-year-old Blue heeler. Both of them love this food! On rare occasions, they have had to try other foods there is less excitement for it and they have the pit mix has a hard time digesting it. 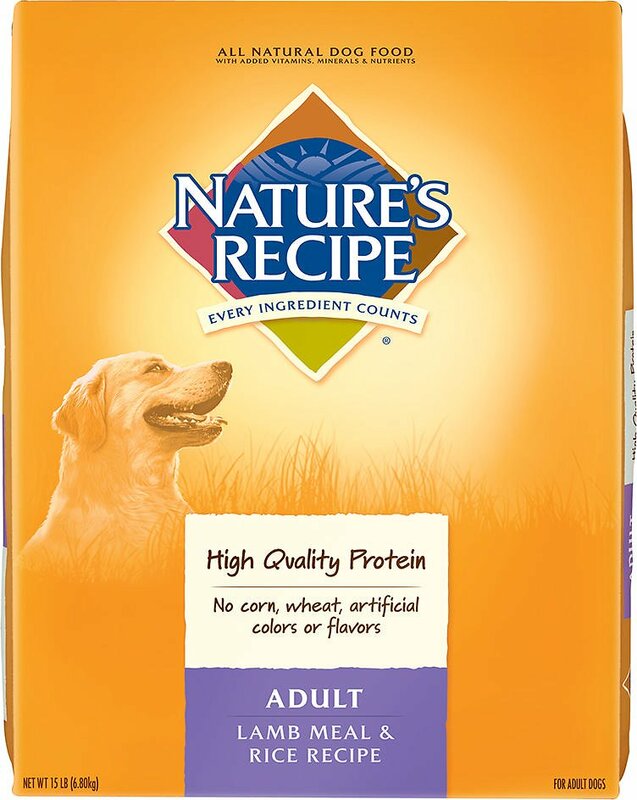 My pup is about two years old, before I put her on this food, she was on puppy food. Since the change over, she has grown muscle, and mass, she is still very thin, but she always has been. We mix this food with a bit of Beniful in the cold months to help her gain a little weight. Even my neighbor's dog is jealous and often makes a quick stop at our house to gobble up the protein. I would highly recommend this product. I'm very pleased with the results, and its affordable. My pit loves this food. He eats less so it lasts longer than grain based diet. Used to use Gravy Train and wanted to find something healthier. It is much cheaper in the long run as he would eat the whole bowl. Now I can fill his bowl and it last 2-3 days. I have three dogs and this is there favorite food, this is also the only place I can find it. Why has it been unavailable for over a month??? I have two dogs who have occasional digestive and skin issues, and this is perfect for them. And, they seem to really enjoy it. I love Chewy. And I have been feeding Nature’s Recipe to all my dogs throughout their life. I have 3 English Springer Spaniels. One is 15 years old, soon to be 16 in February. I attribute his health to Nature’s Recipe. He is a little arthritic, but still has bursts of energy any feels good. Thank you Chewy for providing your great service and Nature’s Recipe for excellent food. I don't recommended this dog food at all. We like to try different brands to make our dogs mealtime more fun. This dog food smells so chemically I would't feed it to anything. My dogs love this food,smell good and the best part they enjoy every bite.